Chichen Itza is one of the new 7 world wonders and for good reason. The view on the big pyramid or Temple of Kukulkan is amazing. The site is located on the Yucatan Peninsula between Mérida and Valladolid. The site is very popular for daytrips from tourists who stay in the Riviera Maya. The main attraction is the big pyramid of Kukulcan or El Castillo. Unfortunately it is not possibly to climb up the pyramid anymore but it is also impressive to see the building and to imagine how the Mayans have constructed it. They must have had quite some knowledge of mathematics and astrology. The ground plan of the pyramid has square terraces with stairways on every side to the temple on the top. Two times a year during the Spring and Autumn equinox it seems like a snake comes down the stairs of the north staircase. This symbolises the feathered snake wich represents Kukulcan or Quetzalcoatle. The shadow moves down by the movement of the sun during the rising and setting of the sun. Underneath the temple archeologists have found another temple. Inside the temple was a Chac Mool statue and a throne in the shape of a jaguar, painted red with spots made of inlaid jade. As most other archeological sites Chichen Itza also has a ball field but it is bigger than many others. Although nobody knows exactly how the ballgame was played the pictures on the walls suggest that the game ended quite bloody. Many people choose to drive to Chichen Itza from Cancun, Playa del Carmen, and Tulum areas. If you are staying in Cancun, or Playa Del Carmen you may choose to take the 180D to get to Chichen Itza. This is arguably the quickest road as it is a major highway, and straight as an arrow virtually the entire way to the ruins. However if you take this route be aware that you will have to pay tollo. An alternative would be highway 109 out of Tulum. This is a much smaller road than the 180D Cancun route and it has some beautiful things to look at along the way. This is also a non toll route so you will save some money. Also a recommended stop along the way would be a visit to Valladolid. This is a beautiful colonial city with colorful buildings, cobblestone streets, and amazing cathedrals. Taking a bus to Chichen Itza can often be the easiest way to get there if you do not feel like bothering to rent a car. Taking a bus is also arguably a safer method because your driver is experienced with driving in Mexico. When going this route there are a few methods to consider. However the most common 2 are using the ADO Bus Service, which is the most popular transit service, or using a tour company service which often provides lunch, as well as other add ons, with many to choose from. Hacienda Chichen offers regional, international and vegetarian dishes, in a 16th century colonial terrace built with Maya carved stones (appropriated from the archaeological site by Spanish conquerors) overlooking lush tropical gardens. Some of the vegetables and fruits are organically grown by the owners in the south end of the gardens. Be sure to drink lots of bottled water. Those not accustomed to the tropical heat and sun can otherwise risk dehydration. There are several refreshment stands in the archaeological site. There are a handful of hotels by the ruins, along the highway nearby, and in the nearby town of Piste, in a variety of price ranges. Some have good swimming pools and restaurants. The town of Valladolid, 40 kilometres away, is a less-touristed alternate base. 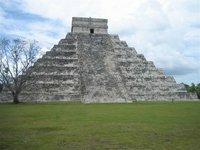 We have a comprehensive list of accommodation in Chichen Itza searchable right here on Travellerspoint. You can use our map to quickly compare budget, mid-range or top of the range accommodation in Chichen Itza and areas nearby. This is version 20. Last edited at 3:16 on Aug 2, 17 by sleepBot. 9 articles link to this page.